5. I'm having problems with applying my template of good and bad locations to my type of house. I actually live in an East facing House, but from my year of birth I am suited to a South-East facing house. Which 8 houses theory do I apply to my current house and how? 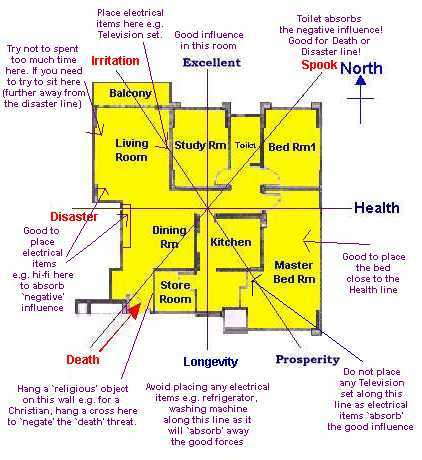 In Feng Shui, even if your house is suppose to be South-East facing, you can still `live' in a West House. The most important point to note is try not to live in any West House that has the `death' line flowing into the house from the main door. If this is the case, there are remedies in Feng Shui e.g. by placing a religious object e.g. a cross' on the wall where the `death' line flows through. What you should do is `screen capture' e.g. the South East facing template from this website. Next, transpose or (using a transparency) superimpose this on a scaled down version of an architect's drawing. Preferably, do use a compass to check out the North of the house i.e. do a reading outside your house or if you are inside your drawing. Preferably, do use a compass to check out the North of the house i.e. do a reading outside your house or if u are inside your house, please steer clear of at least 1 meter from beams/pillars to get an accurate reading. 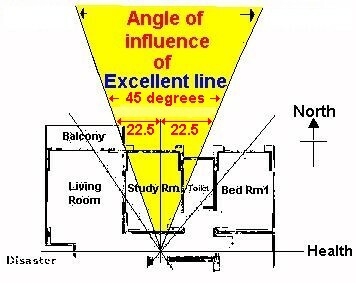 Confirm the North point of the house and mark it as accurately as possible to your layout plan. Sketch out or if you have a transparency, superimpose your `Feng Shui horoscope' onto the entire layout. After doing this, look out for areas where you spent the MOST TIME at home e.g. the bedroom and living room. Being a South East house person, do look out for the above. It is thus preferable that the areas where you spent the most time should be under the influence of good `Qi'. In areas of good influence, try not to `block' them with electrical appliances e.g. TV's Hi-fi's etc. But in areas especially the the `death' or `disaster' line flows, electrical goods be it the refrigerator, washing machine can be used. Electrical goods at a location could alter the field of intangible influence. Some Feng Shui Masters say that this is not necessary so as electrical appliances were invented before Feng Shui and may disagree with the use of electrical appliances. It is left to you to make the final decision of whether to use electrical appliances to `block' adverse Feng Shui influence. However, you do not have much to loose other than having more appliances in your house. Better still if such lines flow into the toilet the better. In such cases, do close the toilet door. For other family members, do get their template and do the same thing. Again, look out for areas where they spend most e.g. bedrooms, study etc. 6. I tried your "The Eight Types of Houses Theory" template but realised that my wife's type of house is the direct opposite of mine (meaning, all those directions that are beneficial to me are bad for her and vice versa). My question is, how then do we position our furniture (beds, chairs, etc.) so that it will be beneficial for both of us? The most important consideration is to find a house that best fits the bread winner i.e. the person who brings in the most money to the home. 1. For the bread winner, avoid the `death' or `disaster' line flowing into your house. If so, there are still Feng Shui remedies for this. 2. For your partner or other members of the family, it is also preferable that the `death' line does not flow through the main door. Examine the locations that both of you will spent most at your home. Normally, this should be your bedroom and any other rooms you spend your time e.g. the living room. Do imagine one of the eight forces flowing to your home e.g. the `health' line. 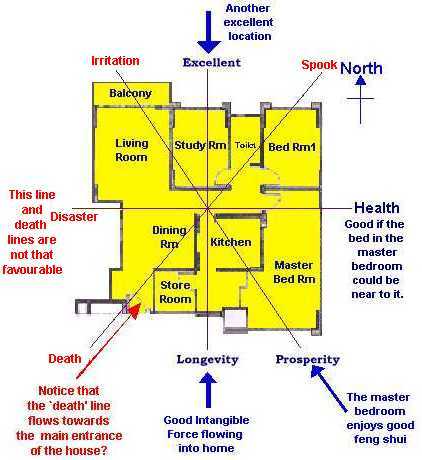 If for example, your master bedroom has the `health' line flowing into the house, (beneficial to you) but at the same time this same line happens to be your spouse's `death' line what you could do is to for you to sleep closer to this line while your spouse sleep further away from this line. If you have to choose between sleeping closer to the death, disaster, irritation or spook lines; try to sleep closer to irritation or spook lines! Remember that the `death' and `disaster' lines are best to be avoided.
" SInce I suggested sharing experiences on Feng Shui (in the Bulletin Board), there has been no 'takers'. I shall therefore start the ball rolling. Hopefully, others will follow. My experience: A year ago I shifted into my brother's empty flat whilst awaiting my own to be ready. At that time, I wasn't so concerned about Feng Shui and its applications, although I do read up on the subject. The crunch came when, not long after having shifted there, I met with two accidents - spained my left leg and had a bad cut on my right. Both accidents involved drains and both were not my own undoing. Luckily for me, they were minor ones. After reading Cecil's website, I did a survey and realised the main door and my bed was in alignment with the 'Disaster' line. That gave me an inkling to those accidents. I decided to shift my bed position. Also, since I have an antique decor of a sitting buddha(I'm a Christian but I like collecting decors), I placed it by the front door. Since then, life has been smooth. I cannot be sure if this smoothness is as a result of Feng Shui application or the Buddha decor or both, But I do believe two coincidences are one too many to ignore. Best regards and GOOD CHI to all, Eve [Tue Aug 4 01:41:13 1998]"